Written by Catherine Saxelby on Tuesday, 30 October 2018. It’s the middle of Spring in Australia and many of us have racked up a few comfortable kilos over winter and want to lose them before summer. I’m not one for food fads and fad diets. I recommend a sustainable, healthy way of eating while acknowledging we’re all different and need to be comfortable in our bodies, whatever their size, as long as they’re healthy. 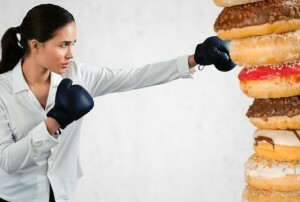 However, even if we’re eating healthily, from time to time we all feel a craving or two. So, this month’s Foodwatch newsletter is all about cravings and how best to deal with them so you don’t stack on unwanted kilos in the first place. Do you find yourself thinking that a cup of coffee would be so much nicer with that doughnut? After all it looks so enticing. Or maybe when your train is late you crave a chocolate bar just to take the edge off? Or perhaps you find that a biscuit really helps the creative process when you've a tricky problem to solve at work? In this month's Foodwatch Newsletter we'll point you to the resources - from magazine articles to books and eBooks - that will help you understand why we crave certain foods and how we can develop workable strategies to conquer with them. We'll also point you to free articles on the Foodwatch website that can assist you to understand why you eat the way you do, and how to be aware of your reasons. I'll also talk about what I'm making, and eating this month. So check out the October edition of the Foodwatch Newsletter, and while you can read it on the web, why not subscribe here to our monthly Foodwatch Newsletter and have it delivered to your Inbox on the last Tuesday of every month? I have a favour to ask. I'd love to know what topics you're interested in reading about, both in the Newsletter and on the website. I have a quick, 4 question, survey and I'd love it if you could click through and answer them to help me. Thanks. Make veg the hero - for those scaling back but not cutting out meat altogether.